Discussion in 'BSA' started by gjr, Feb 26, 2019. The parts book shows a front brake cable with a switch ( similar to '70 Commando) for the USA. 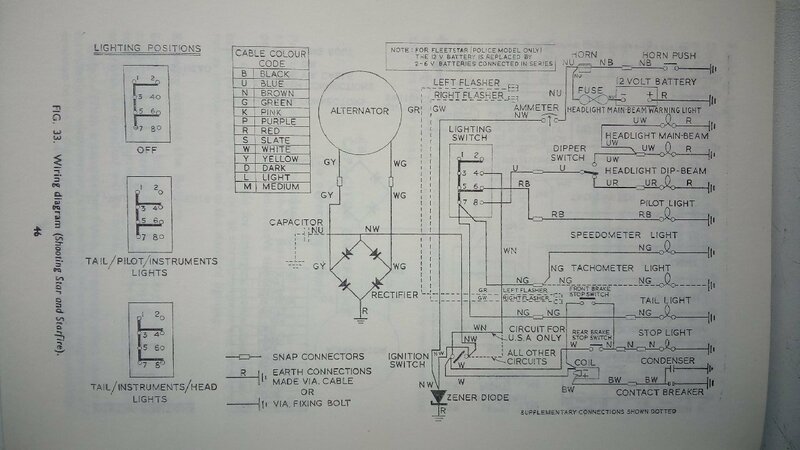 The service manual I have only shows a modification for the ignition circuit for American markets, nothing about a front brake light switch. It looks like I could pick up power from the white wire to the coil and run a brown wire back to the otherside of the rear brake light switch but that would look kind of cobbled together. Any advice as to how to wire in the front brake light switch ? If you have a 69 or 70 then the wires are in place by the headstock, brown and white. Well, That explains it. The bike is a '67 by the serial number but my brother' parts book is a '68. I should have checked everything. I think I'm still going to wire it in because the rear brake light switch is such a piece of junk, mostly down to the flimsy 'rubber' cover that holds the whole thing together. If any future owner is truely offended they can always remove it. Peter Quick, www.bsaunitsingles.com has em in stock.